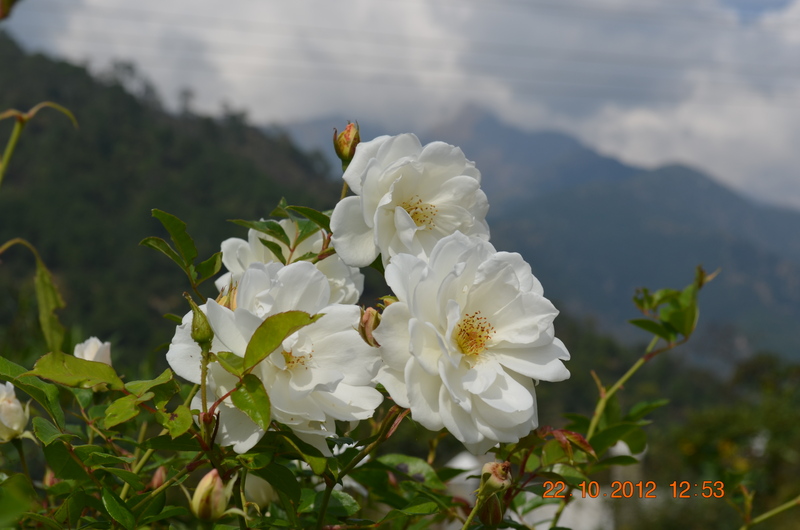 White blossoms near the Neugal river, Himachal Pradesh. Festive streets of Kotwali bazaar, Dharmashaala. Bridge over Neugal river, near Saurabh Van Vihar, Palampur. 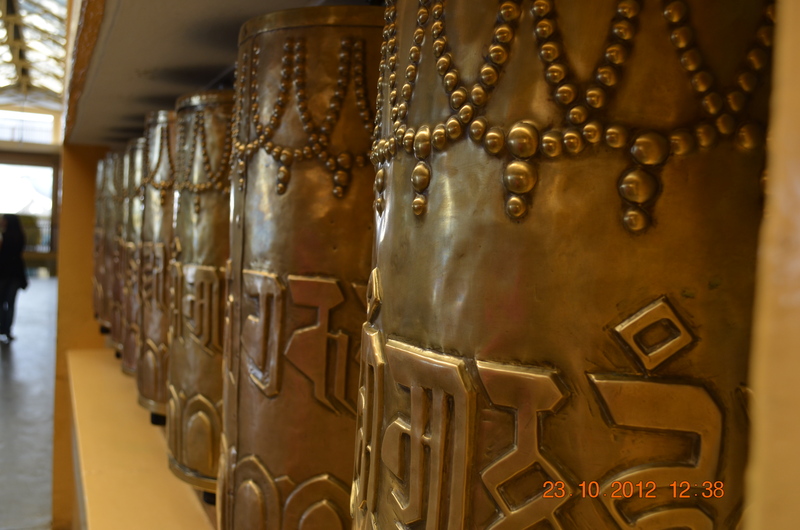 Prayer wheels at Dalai Lama’s temple, McLeodGanj. This post is part 2 of the series describing my trip to Dharmashaala (read part 1 here). PHOTOS CREDIT – Aparna. In Dharmashaala, we stayed at the Himachal Pradesh tourism hotel, called the Kashmir house. Built in 1935, this mansion was formerly owned by the Jammu and Kashmir king Hari Singh. 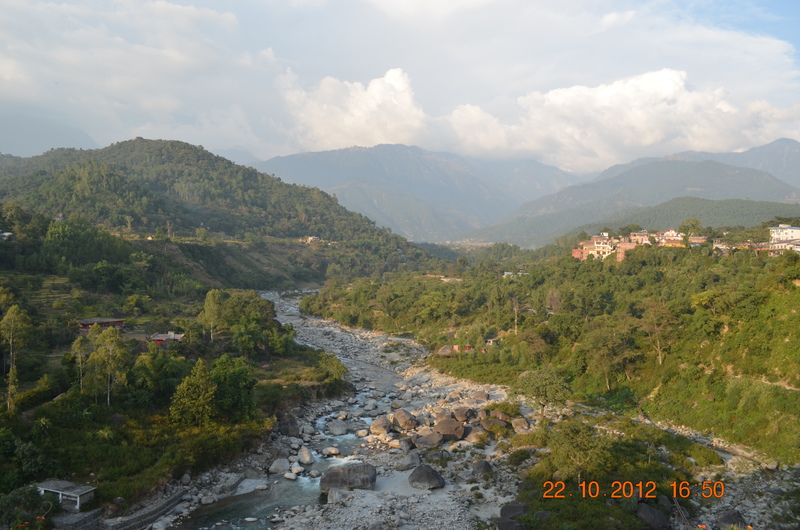 My cousin brother and me were lucky – we got to stay in a tower room, with tall glass windows on 3 sides and views of the Himalayas above and the town of Kangda below. Dharmashaala is pleasantly quiet (especially for us city people). Just the sound of crickets and some occasional announcements, the state election campaigns being in full swing. 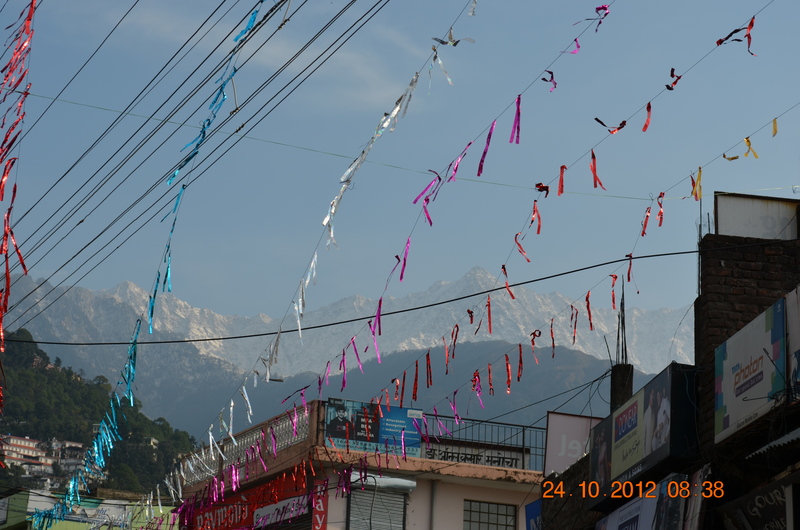 Though this town receives among the highest rainfall in India, it was very sunny on the days we stayed. Giving us an opportunity to take walks every morning. On one of the days, we accidentally came across Hari Kothi, the palace of the Queen of Chamba, where Swami Vivekananda visited in 1887 (we were not allowed inside though). The pleasure of unexpected discoveries! We visited Tapovan, the samadhi of Swami Chinmayananda. A very peaceful place, the samadhi itself is in a glass room facing the Himalayas. Chinmaya mission, established by his devotees, spreads his principles of Vedanta. The next stop was Saurabh Van Vihar. Situated on the banks of Neugal river, this has been created in honor of Captain Saurabh Kalia, killed in torture during captivity, by Pakistan. Do not be fooled by the beauty of this park with tall deodar trees, the area has been classified as Zone 5, with high possibility of earthquakes, and also flash floods. Baijnath temple was the last stop before we returned back. A very old temple, Ravan is said to have offered his 10 heads to Lord Shiva at this place. Pleased, Shiva granted the heads back along with the power of invincibility. In honor of Ravan, this place doesn’t celebrate Dussehra. The cab took us 200 metres above, to McLeodGanj or upper Dharmashaala. Back in 1959, India provided refuge to Tibetians, escaping Chinese prosecution. Many people come, to meet His Holiness the Dalai Lama, who resides here. Then on to Bhagsu Nag temple, which gives the place its name (Dharmashaala was earlier known as Bhagsu). This temple is the Kul Devi of 1st Gurkha Rifles. Just behind the temple is the climb up to the beautiful Bhagsu waterfalls. Slate mining on the slopes (now banned), had in the past made this Panchayat among the richest in India. A desire to have tea in the afternoon gave me a chance to interact with a few Tibetian refugee monks in the small tea-shop. One of them had come over from Tibet in 2004, and was undergoing a 2-year course. Though ever-smiling, I have no idea what he must have gone through before he reached here. Read the final part here. 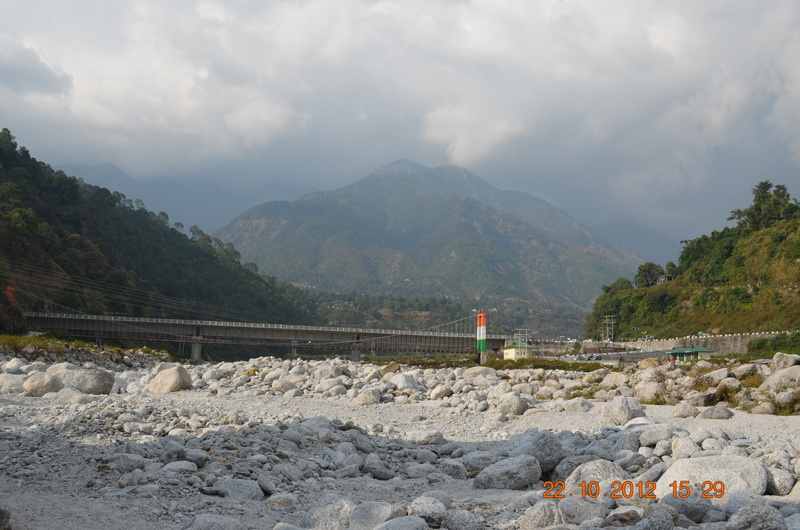 A view of the Binwa, tributary of Beas, with Paprola on one side and Baijnath on the other. 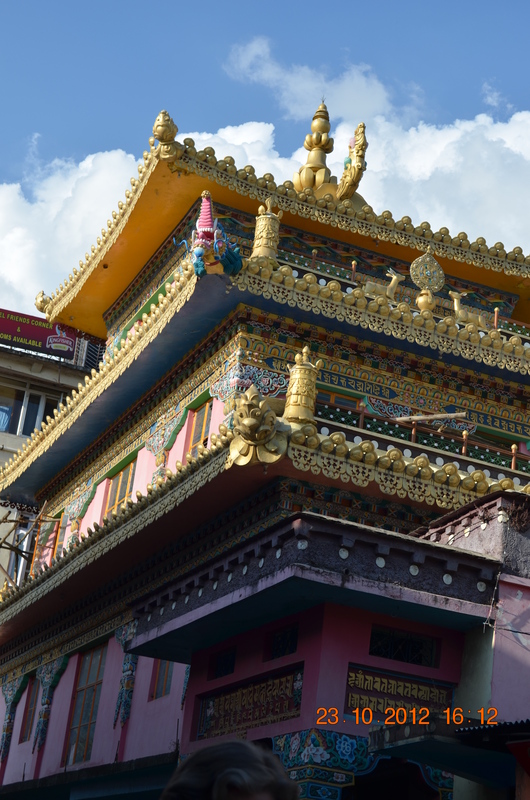 A monastery, captured while roaming the streets of McLeodGanj. 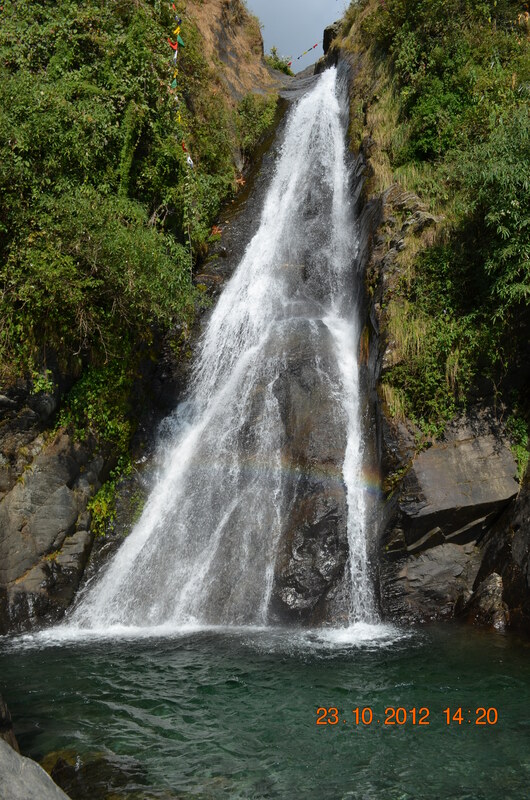 The crystal clear and serene Bhagsu waterfalls, McLeodGanj. 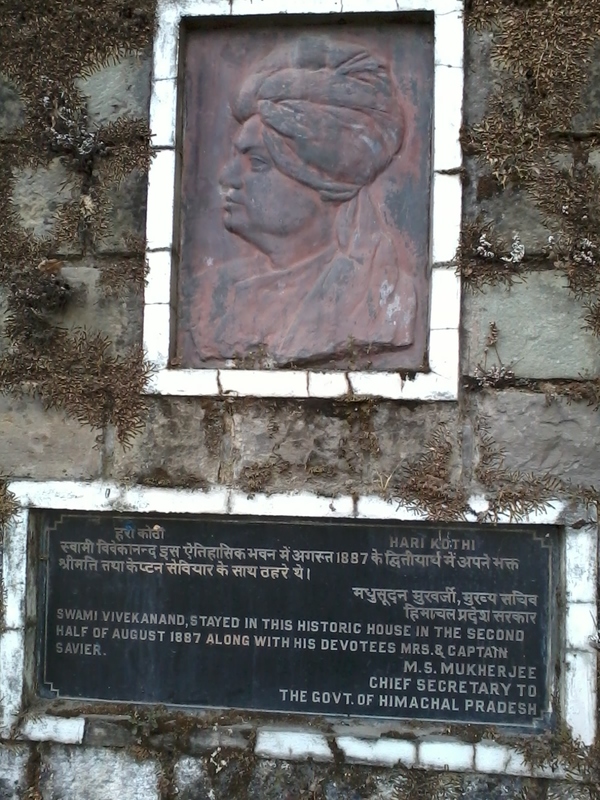 The plaque outside Hari Kothi, Dharmashaala, indicating Swami Vivekananda’s visit. Previous Post O Himalayas, here I come!